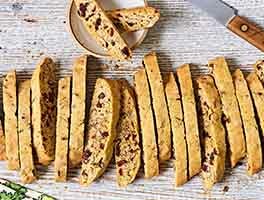 These ginger-packed American-style biscotti (gently crisp, rather than rock-hard and dense) are a perfect light dessert or lunchbox treat. 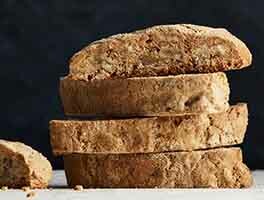 This recipe comes from the biscotti chapter of The King Arthur Flour Cookie Companion, featuring over 500 pages of delicious recipes for cookies, plus comprehensive sections on tools, ingredients, techniques, and hundreds of helpful how-to illustrations. In a medium-sized bowl, beat the butter, sugar, salt, spices, vanilla, and baking powder until the mixture is smooth and creamy. At low speed of your mixer, add the flour and crystallized ginger, stirring until smooth; the dough will be quite soft and sticky, but should hold its shape when you drop it from a spoon. Transfer the dough to the prepared baking sheet, and shape it into a rough log about 14"-long. It will be about 2 1/2" wide, and about 3/4" thick. Using your wet fingers, smooth the top and sides of the log. Bake the dough for 25 minutes. Remove it from the oven, and allow it to cool on the pan anywhere from 5 to 25 minutes; just work it into the schedule of whatever else you're doing in the kitchen. Wait another 5 minutes, then use a serrated knife to cut the log into 1/2" to 3/4" slices. Cut at a 45° angle, for long biscotti; cut crosswise slices, for shorter biscotti. As you're slicing, be sure to cut straight up and down, perpendicular to the pan; if you cut unevenly, biscotti may be thicker at the top than the bottom, and they'll topple over during their second bake. Set the biscotti on edge on the prepared baking sheet. Return the biscotti to the oven, and bake them for 25 to 30 minutes, until they feel very dry. They'll still feel a tiny bit moist in the very center, if you break off a piece; but they'll continue to dry out as they cool. Remove the biscotti from the oven, and transfer them to a rack to cool. Once the biscotti are cool, store airtight, to preserve their texture. If biscotti aren't as crunchy as you'd like (and the weather is dry), store them uncovered, overnight, to continue drying. Biscotti can be stored at room temperature for one week; for longer storage, wrap airtight and freeze. For smaller biscotti, shape the dough into two 12" logs, about 2" wide. Bake as directed above. I used the KAF biscotti pan. I tweaked a little: Cut back on the brown sugar a little and added 2 tbsp. molasses - I like the gingerbread flavor it infuses. Used the KAF Gingerbread spice (2 tbsp.) instead of the spices listed. I used 180 grams KAF white flour and 60 grams KAF almond flour for a total of 2 cups. Then after they cooled, I drizzled a lemon icing - powdered sugar, lemon zest and lemon juice from my lemon tree. Then I put them in little clear bags with a festive ribbon and gave them away. This is a text I got: "OMG, those ginger biscotti are amazing!" Will definitely make again soon. My wife loves crystallized ginger & is a lifelong biscotti fan. 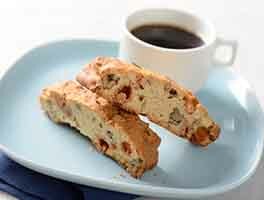 On a whim I did a couple of searches for ginger biscotti one day and found this recipe. It was an immediate hit, she loves it! I'm not a huge fan of ginger, but in fact I quite enjoy it myself! So thank you KAF, for a great recipe! f.w.i.w I now make a double batch at a time. I then divide the dough into 4 small batches in order to make the "Mini Biscotti". I keep half in the fridge while I bake the first 2 small logs, then the other 2. I do get about 6 dozen out of this double batch. I freeze 4 dozen, a dozen to a pkg, wrapped in aluminum foil, then into freezer bags. They don't really have to thaw so much as just warm up when we take them out of the freezer & wife thinks it enhances their flavor! I made some spiced pepitas (sugar, ginger, cinnamon, nutmeg and a dash of cayenne) and pressed these on the top of the biscotti before baking it the first time. Looked pretty and tasted great. 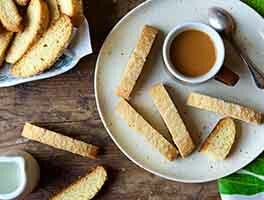 Nice biscotti recipe. This is the first recipe I'd ever used to make biscotti and they came out perfect and scrumptious! Nice and gingery. And I dipped one end of them in dark chocolate coating. Mmmm. So I'm making them again right now. Can't wait to get them out of the oven and where they belong—on tea plates in front of my friends and me! I make a lot of biscotti and this is the BEST recipe. Delicious and makes a great, easy-to-work-with dough. Highly recommend. 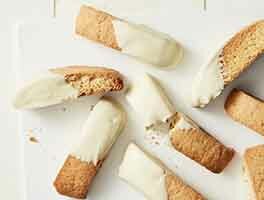 If you love ginger as much as we do, look no further for a outstanding Ginger Biscotti recipe. I followed the directions exactly as written and we now have our "house" biscotti. I made these with 1/2 cup of KAF's soft diced ginger and used the KAF biscotti pan. Delicious and easy. 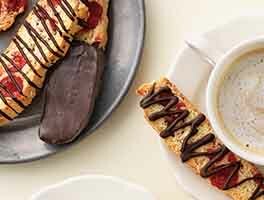 my favorite biscotti recipe....easy and yummy. These were VERY good. I used 1/3 cup ginger and 2/3 cup KAF cinnamon bits because that's what I had on hand. Great results! !